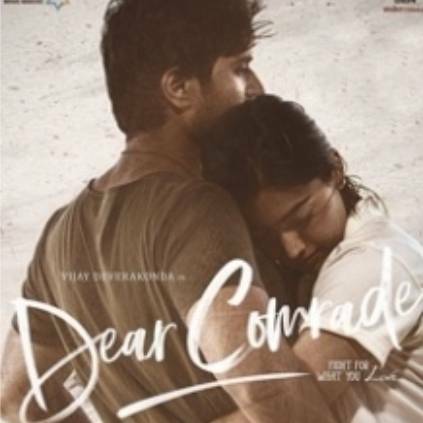 Dear Comrade is an upcoming political drama directed by Bharat Kamma starring Vijay Deverakonda and Rashmika Mandanna in lead roles. This is Vijay Deverakonda's second film opposite Rashmika Mandanna after the 2018 romance Geetha Govindam. The makers have released a single today, on April 8th. The song is released in all four South Indian languages, namely Tamil, Malayalam, Telugu, and Kannada. The actor had tweeted the links to the song in his official Twitter account. The song is titled 'Aagaasa Veedu Kattum' in Tamil. The song is composed by Justin Prabhakaran and the lyrics are written by Kaathale Kaathale fame lyricist Karthik Netha. Gowtham Bharadwaj has crooned this melodious number. On the technical front, Dear Comrade has cinematography by Sujith Sarang and produced by Mythri movie makers. Stay tuned for more updates on the film. People looking for online information on Rashmika Mandanna, Vijay Deverakonda will find this news story useful.